Panopera & Music at the Crossroads present: "Prophets, Preachers and Prayers"
"Prophets, Preachers and Prayers: selections from operas and oratorios"
"Prophets, Preachers and Prayers: selections from operas and oratorios", featuring the Edwards Church choir and some of the area's finest singers and instrumentalists. 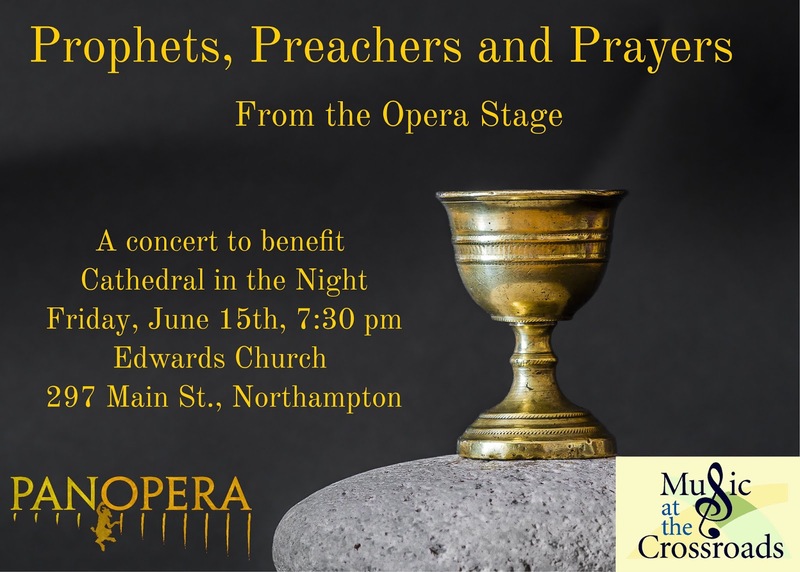 Panopera regulars Alan Schneider, tenor, Katherine Saik, soprano, and Chris Mortensen and Fleur Barnes-Rowell, horn, will participate, as well as returning guests Sarah Briggs (Carmen), Ramsey Kurdi (Carmen), Jenna Rae (Tosca), and Hugh Keelan (Tosca, La Boheme). Admisson is free, but donations will be accepted to benefit Cathedral in the Night.